The Main House rooms were designed to offer guests a genuinely unique lodging experience. The two rooms (The Sheffield and The Lovett) are located on the second floor of the 1885 main house. Each is similarly designed and capable of meeting the most discerning travelers' needs. Staying in a 130-year old house is a different and exciting experience. The rooms will offer every comfort during your stay. The rooms include everything you could possibly need for your stay, such as deluxe bedding, a small sitting area, a fireplace, a 42" flat-screen television, a refrigerator, drinks and snacks. 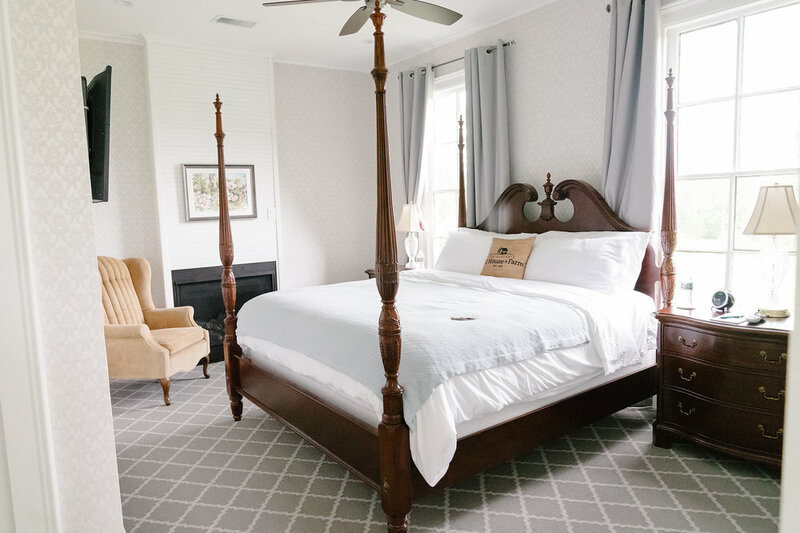 The bathrooms at The Historic Hill House and Farm are top-of-the-line with upgraded Kohler finishes, filtered water out of every fixture, high-end bath products, and comfortable towels and robes. Each room comes with a hair dryer and iron. The Main House rooms have direct access to all of the Main House common areas before and after they open and are available to other guests.